With the Bharatiya Janata Party (BJP) win at the polls, Narenda Modi will be sworn in as India’s next prime minister today. The election gained the attention of the world, not only because it is the world’s largest exercise in democracy, but primarily because of the heightened interest in what kind of leader Modi will become, and what kind of policies he will pursue. It is similar to the heightened interest that surrounded Japan’s Shinzo Abe before he became that country’s prime minister for a second time in December 2013. In fact, comparisons are frequently drawn between the two leaders. While the comparisons are spurious, it nevertheless highlights the growing relationship between the two Asian democracies. With Modi as premier, the world can expect a strengthening of India-Japan ties that is sure to raise China’s suspicions. At first blush, the two gentlemen are indeed a lot alike. Both are seen as decisive leaders who get things done (Modi is even called the “Iron Man” by his supporters). Both speak of restoring their countries’ lost dynamism. Both prioritize economics and promote bolstering their militaries and greater national pride amongst their citizens. Yet, these obvious similarities can be deceiving. For example, while the two gentlemen are considered conservative nationalists, speak tough against historical rivals, and oppose China’s growing assertiveness in the region, Modi and Abe are not cut of the same ideological cloth. Consider first the nationalist tag. As a self-proclaimed Hindu nationalist, Modi is a polarizing figure, cleaving through the idea of a secular India by pitting the majority Hindus against the 175 million Muslim minority. He is a card-carrying member of the far-right, Hindu nationalist Rashtriya Swayamsevak Sangh (RSS), a former member of which assassinated Mahatma Gandhi within months of India’s independence in 1948. His election campaign has not helped alter this polarizing image. During his campaign some of his supporters reportedly threatened that his opponents would have to leave India and move to Pakistan once he became premier. There were even suggestions that Muslims could be prevented from buying property in Hindu-dominated areas. His BPJ’s manifesto even mentioned it would explore the possibilities of facilitating the construction of a Hindu temple on the site of the 16th century mosque at Ayodhya, which the BJP helped demolish in 1992. Critics contend it could be India’s version of Japan’s Yasukuni Shrine, in that it has long been associated with an ultranationalist and inflammatory interpretation of Hindutva (Hindu nationalism). Abe, on the other hand, while making headlines for his views on history and various pieces of security-related legislation, is not as polarizing a figure. While he does not openly call himself a nationalist nor is he a member of a far-right political party, he is a strong supporter of reviving pride in Japanese history and culture. True, Abe makes diplomatic waves through actions that infuriate Japan’s neighbors—such as visiting the controversial Yasukuni Shrine that honors 14 Class-A war criminals from World War Two—which results in his critics claiming he glorifies Imperial Japan’s war policies. Still, there is no actual evidence that he harbors anti-Chinese or anti-Korean sentiment. Instead, he has consistently sought to open a dialogue with his counterparts in Beijing and Seoul. In fact, during the election that brought his party to power, his party’s campaign manifesto specifically called for developing relations with China and South Korea. Likewise, Modi and Abe’s backgrounds differ considerably. Abe is very much part of Japan’s political establishment. He comes from a prominent political family where his grandfather was prime minister and his father served as a foreign minister. Abe himself slowly rose through the ranks of his Liberal Democratic Party (LDP) before becoming premier in 2006. Throughout it all, Abe has been given increasingly important party and central government posts. Modi, as a state chieftain for the last 12 years, is a rank outsider who has never walked the corridors of Delhi’s power elite but now will become the country’s first post-colonial born prime minister. In Modi’s own narrative he is a man who, through the sheer dint of his own efforts, rose from humble beginnings as a low-caste tea-seller. And while both are pro-business and have prioritized economic policies, there is a clear difference in how they have articulated this shared goal as well. Out of a desire to promote inflation and revive economic growth, Abe has pushed forth with an economic program called Abenomics, replete with the “Three Arrows” of monetary easing, fiscal expansion, and structural reform. There is, however, no clearly articulated Modinomics economic program. Unclear what his vision for the economy is, the “Gujarat Model” he espouses has critics decrying his Modinomics as mere propaganda, with high profile events such as the Vibrant Gujurat Global Investors Summit concealing poor performance on social indicators. While Abenomics’ structural reform has been criticized as lacking substance, the Gujarat Model’s focus on infrastructure, investment and e-governance has been criticized as leaving the state lagging behind in public health, education, infant mortality rates and women’s literacy. The Gujarat Model, Nobel Laureate Amartya Sen observes, may have helped businesses but has left the state lagging behind in key social indicators. While the personal comparisons are therefore specious, it is a fact that the two think highly of each other. When Abe visited India in 2007 as premier, diplomatic protocol precluded him, as a sitting prime minister, from traveling to meet then-Chief Minister Modi. Nonetheless, Modi flew to New Delhi to spend time with Abe. Likewise, when Modi visited Japan in 2012, Abe, then part of Japan’s opposition, made an effort to see Modi. And when Abe’s LDP won a landslide victory in December 2012, Modi broke diplomatic protocol again and called to congratulate him despite the fact that he was still only the Chief Minister of Gujarat, not a head of state. Notably, Japan was one of only a handful of countries Modi visited while he was Chief Minister. And, Modi is one of the three Twitter accounts that Shinzo Abe follows on the social media site. There is already some concrete action to back up their soaring rhetoric. When Modi was largely isolated by the West following his controversial role as Chief Minister during the 2002 Gujarat riots that killed more than 1,000 people—most of them Muslim (and earned him the sobriquet “India’s Milosevic”) —he pursued a provincial ‘Look East’ policy that focused on Japan. In fact, it was during Abe’s first stint as premier in 2007 when Modi first visited Japan to open new investment channels after Western funds dried up. This has paid off in the years since as evidenced by the fact that significant Japanese investment—both private and official—has flowed into Gujarat. For example, JETRO partnered with Gujarat in 2009 to organize a Davos-type event to attract foreign capital, called the Vibrant Gujurat Global Investors Summit. Gujarat also continues to attract significant investment for infrastructure projects and even a new plant by the Japanese giant Suzuki Motor Corp. Yet, Modi’s and Abe’s predecessors deserve much of the credit for these actions. Over the past decade, Manmohan Singh and his numerous Japanese counterparts—beginning with Junichiro Koizumi—have worked to strengthen economic and strategic ties. Today, the two countries enjoy rapidly increasing economic ties—particularly following the 2011 Comprehensive Economic Partnership Agreement—and growing strategic ties that now include naval and Coast Guard exercises, regular summits, and India’s plans to purchase US-2 planes and other aircraft from Japan, which would make Delhi the first country since World War Two to buy military aircraft from Japan under recently relaxed arms export rules. Building on this past decade of growth, and undergirded by their mutual admiration, personal friendship, and a desire for closer bilateral ties, Indo-Japan ties will flourish under Modi and Abe. Both recognize the importance of strengthening their domestic economies while simultaneously expanding their bilateral ties from the existing economic foundation toward stronger strategic ties. From Japan’s perspective, it has spent most of the past decade quietly establishing and then strengthening strategic relationships with countries throughout the region. Alongside Australia, India is at the top of its hierarchy of new relationships and arguably forms the western-most anchor of Japan’s foreign policy strategy. From India’s perspective, engagement with Japan and a furtherance of its Look East policy will likely form the centerpiece of its foreign policy, particularly since Modi’s status as a pariah with the U.S. is likely to constrain ties with Washington. Of course, their stronger bilateral ties vis-à-vis China will garner much attention. 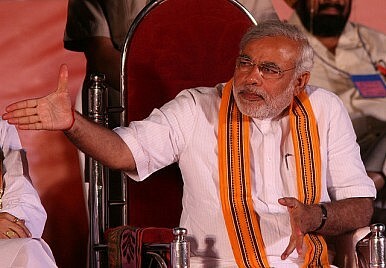 During his campaign, Modi argued that China should let go of its expansionist policies along their disputed border. With Modi’s first major foreign policy statement during his campaign focused on China’s assertiveness, and with Abe being more proactive in pushing back against Chinese assertiveness in the East China Sea, the expected strengthening of India-Japan ties under Modi and Abe will undoubtedly make China uncomfortable. And with good reason. Both Abe and Modi have criticized opposition parties within their own countries for being weak on China. This leads to the question of whether China can expect more joint opposition to its assertiveness and more calls to act as a responsible regional player commensurate with its economic power. And given their mutual desire to bolster their militaries, there are questions regarding whether closer strategic ties could lead to closer operational ties, which could serve as a bulwark against China’s rise. At the same time, because Abenomics and Modinomics are the centerpiece of their political agendas, Modi and Abe cannot risk fueling Chinese paranoia over stronger India-Japan ties. After all, while both leaders will want to take a strong stand against China, particularly regarding territorial disputes, they have to do business with Beijing to achieve their economic goals. Consequently, they will be forced into making pragmatic choices toward what “fights” to pick with China. This may limit Modi and Abe’s ability to work in unison vis-à-vis China. Despite comparisons between the two gentlemen, Modi is not and cannot be India’s Abe. Yes, the two gentlemen are strong leaders who prioritize economic objectives, but a closer examination shows crucial differences. Importantly, their countries are also opposites in many regards. India’s plural society, ethnic and religious diversity, exploding youth bulge and bloating cities are a far cry from the relatively homogenous, graying and shrinking Japan. What this means is that while personal affinity for each other and each other’s countries is likely to translate into stronger India-Japan ties, the sum of their relationship vis-à-vis China is yet unknown. Jeffrey W. Hornung and Shyam Tekwani are associate professors at the Asia-Pacific Center for Security Studies in Honolulu, Hawaii. Dr. Hornung is also an Adjunct Fellow with the Office of the Japan Chair at the Center for Strategic and International Studies (CSIS) in Washington, DC. The views expressed in this article are their own. US-Japan Trade Agreement Negotiations: Why Now?The Art of the Balance: Japan, China and the United StatesWill Japan and Russia Finally Settle Their Territorial Dispute?India, Japan Mull Allowing Their Armed Forces to Use Each Other’s Military BasesThe Key to Securing the Indo-Pacific: Japanese Constitutional Reform?